The folowing information has been supplied to me via a cd from the inventor Mal Beare of this motor. 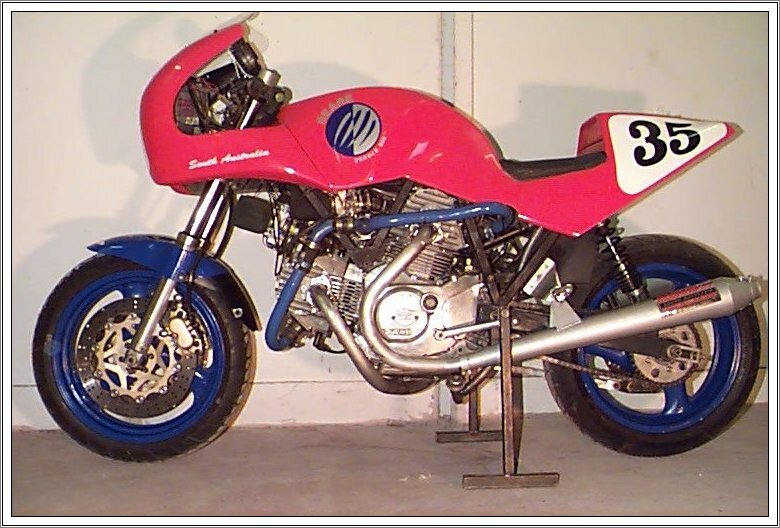 There have been three working prototypes that have been successfully tested using a Ducatti motorcycle in Adelaide South Australia and found to vastly superior to equally sized motor. The inventor is now seeking finacial and other support to bring this motor to the mass market. if you can offer assistance please contact Mal Beare directly or at the address at end of this webpage. (1) The 6-stroke engine is fundamentally superior to the 4- stroke because the head is no longer parasitic but is a net contributor to, and an integral part of the power generation within the engine. (2) The 6 stroke is thermodynamically more efficient because the change in volume of the power stroke is greater than the intake, compression, & exhaust strokes. (3) The compression ratio can be increased because of the absence of hot spots. (5) The absence of valves within the combustion chamber allows design freedom. 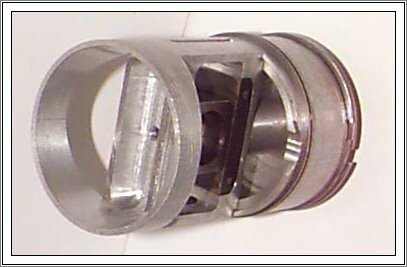 (6) A one-piece engine from crankshaft to upper shaft becomes feasible. (8) Can be fitted to standard engine blocks so the market is much larger than the OEM sector, also includes the retro fit after market sector. (b)There are no valves to drop or bounce. (c)The rev limit is only what the bottom end can stand. (e)Gas flow on intake increase of 20%. The mass of the reciprocating parts in the head is about the same as a 4 stroke but the accelerations are much slower so energy absorption is less. The piston speed of the upper piston is about a quarter of the main piston; therefore its service life should be at least twice that of the main piston. There are no service adjustments necessary. There are no valves to drop or get hit if a timing belt snaps and the effective rev limit is only what the main piston will stand. The design has similarities to the Atkins and Miller designs in that the expansion stroke is larger than the intake stroke. 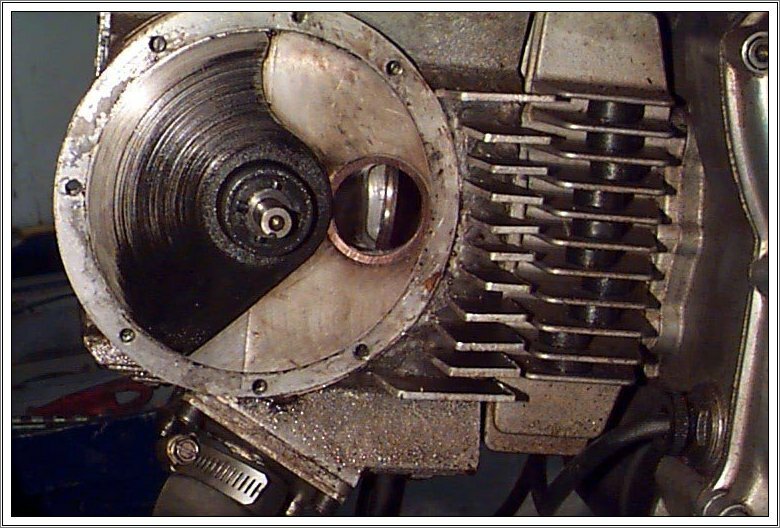 Per single cylinder the number of parts in the Beare design head is fifteen compared to a single overhead cam 4 stroke of approx. 40 to 50 parts. The design also allows the production of a single piece engine (i.e. head cast with the block) further reducing machining and therefore costs. 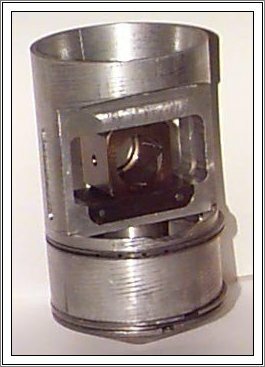 The tips of the reed valves are positioned close to the intake port windows, thus achieving a similar result to variable cam timing. At low throttle & revs the petals only partly open and keep gas velocity high .At full throttle & high revs they fully open to allow maximum flow. The exhaust disk does not touch anything and is only subject to sub atmospheric pressure, not gas flow; therefor its service life is infinite. The exhaust valve is a piston port. The simplest layout for car engines is the flat 4 or V4, with internal central chain drive to the heads. This layout allows access to 3 sides of each cylinder, with exhaust discs each end of the motor and reed valve blocks both sides of each cylinder. In line layouts the drive chain or belt is at the end with a row of exhaust disks down one side and a row of intake disks or reed blocks down the other side. A right angle drive is taken off the drive chain with a very light internal drive chain to the disks, or a direct drive is taken off the drive chain with light right angle drive at each disk. According to the theory more torque is derived if the upper piston drive is advanced in relation to the main crank. This would be so if all other factors remain constant. Advancing the upper piston drive has detrimental effects on valve timing, combustion chamber volume and rate of change in volume during the combustion period and total engine volume. The effect is to open the exhaust port earlier, reduce the amount of valve overlap and close the intake port earlier. Opening the exhaust port earlier means that the expansion stroke is effectively shortened and less energy is extracted. Reducing the amount of overlap does not allow enough time for intake to clear the combustion chamber and the exhaust extraction effect is reduced. The earlier intake port closing reduces charge filling and volumetric efficiency. (2) Combustion chamber volume is effectively increased thus lowering compression ratio. The rate of acceleration of expansion is faster in the earlier periods, contrary to the ideal of a constant volume during combustion. The effect is to reduce change in volume during intake and compression and increase expansion and exhaust, thus reducing volumetric efficiency of intake. 3/ lowering intake port lower lip to provide later intake closing. In practical tests actually retarding the upper piston drive has a positive outcome on power output and efficiency, largely because it effectively increases compression ratio, reduces the rate of change in volume during the combustion period, opens the exhaust port later, increases the period of valve overlap thus utilizing the exhaust extraction effect and closes the intake port later. The negative effect of this is to increase the amount of energy input to the head, but this is more than compensated for by the positive outcomes.